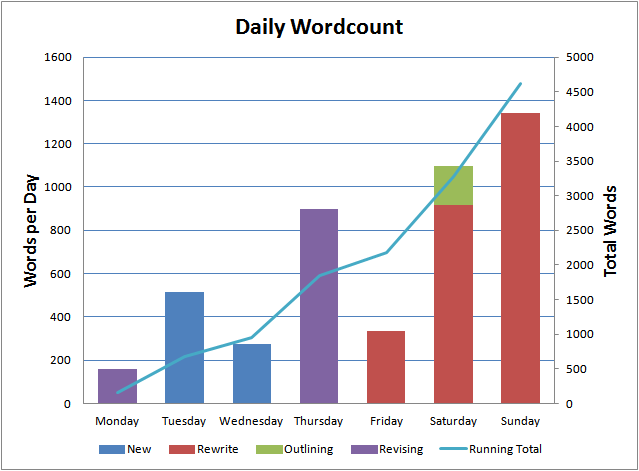 Last week was pretty solid, 4,622 words. I did do a quick bit of work on the outline for the Diary project but otherwise the bulk of that came from a couple of chapters of The Ghost Smuggler that I’m rewriting completely. The next two weeks should be pretty productive. My wife is away in England so I won’t be distracted by TV, movies or theatre. Assuming I can stay away from the Titanfall beta (I’m not a big fan of first person shooters but Titanfall is a lot of fun), I should be able to get a fair amount of work done on The Ghost Smuggler. My goal is to get a second draft finished so that my wife can read it when she gets back. That won’t necessarily mean big word counts because a lot of the work I need to do is revising what’s already there but there are a few chapters that I’m completely rewriting and some completely new content. I’m pretty happy with the way it’s going at the moment but I keep coming up with ideas that a) make the book better b) require me to go back and add to chapters I’ve already revised. At this rate I’m going to need 2-3 more big drafts before it’s ready for the next step. That next step will be sending it out to an editor. I’m not planning on self-publishing The Ghost Smuggler at the moment, but I do want to get some feedback from a professional editor. I’m just too close to really tell where it needs work.